Dead men don’t tell tales. They wail them from the top of the tallest tower. Lady Guinevere (Guin) Harvey would much rather be writing gothic tales of intrigue and adventure than dancing attendance on her sister, the newly married Duchess of Silberwald. Until they arrive at Silberwald Castle, a place of enchanting perfection—and gothic shadows. 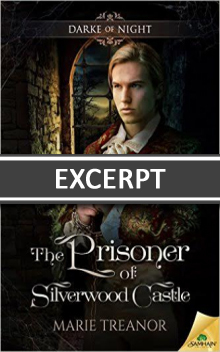 Ghostly groans and clanking chains lead Guin through ancient, misshapen passages to one of the castle’s many mysteries: a cell where the odd but charming Kasimir is kept chained like an animal. He could be a figment of her vivid dreams, the ghost of a dead, mad prince, or just a political prisoner no one wants to talk about. Desperate to discover what beast is howling such soul-chilling cries, Guin summons the medium Barbara Darke. But by the time Barbara arrives, Guin can no longer distinguish dream from reality, friend from enemy. Even with all Barbara’s unique talents, they have to face new dangers before they finally discover the terrifying truth of Silberwald Castle. The tea was duly poured, milked, and passed by the younger lady, whose name seemed to be Hilde. The porcelain cups were exquisite, eggshell china, smooth as silk against my lips. The tea itself wasn’t great, but the Silberwald ladies seemed so pleased with their achievement that I pronounced it excellent. Augusta made no comment. I drank it quickly and said good night. Augusta frowned at me, as if I should have asked her permission. Then, when I laughed, she waved me away with an irritated flick of the wrist. She had Button and her adoring new ladies in waiting. The passages back to my own chamber had grown chilly, making me shiver, so I resolved to collect a shawl before I went about exploring. I found a maid in my room, closing the shutters and the window. The maid gave a nervous smile as she clambered down from my trunk and hurried towards the door. “You mean it’s falling down?” I wasn’t sure if I was more intrigued or appalled. Then how did they know it was dangerous? “Why not?” I asked. “Like what?” I asked avidly. “I imagine it might,” I said, impressed. “Oh yes, thank you.” Since she was clearly in a hurry, I’d find out for myself. It would, I assured myself, be more fun that way. So I let the maid go and set about my preparations. Before dousing the lamp, I lit a candle from it, setting it on the bedside table while I dug a shawl from the wardrobe. But I yawned as I wrapped the shawl around my shoulders and languidly pushed my spectacles more comfortably onto my nose. On impulse, I sat down on the bed, trying it for comfort, and realized I was more tired than I’d thought. Although I didn’t mean to close my eyes, I did. Marie has published more than twenty ebooks with small presses, (Samhain Publishing, Ellora’s Cave, Changeling Press and The Wild Rose Press), including a former Kindle bestseller, Killing Joe. Blood on Silk: an Awakened by Blood novel, which won the 2011 Hollywood Halloween Book Festival prize for Fantasy, was her New York debut with NAL. Recently, she has also dipped her toe into self-publishing.